The Newton County Special Weapons and Tactics (S.W.A.T.) team was formed in 1979. Two of the founding members of this team are our very own Sheriff Ezell Brown and Chief Deputy Jerry Carter. The S.W.A.T. team’s mission is to respond to high risk arrest situations such as: Barricaded Gunmen, Hostage Situations, Sniper Fire, and special events where the possibility of violence exists. Once on scene, the team is tasked with neutralizing these threat(s) with minimal damage to life, and property. Each S.W.A.T. 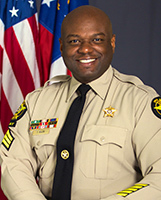 team member is highly trained with weapons, first aid, and evolving tactics to serve the Sheriff’s Office in its efforts to serve and protect the Citizens of Newton County. The team also assists with Civil Disorder, Riot Control, and any other situation the Sheriff’s Office believes the team’s skills are needed. The S.W.A.T. team is dedicated to the task(s) above and will always answer the call. This team participates with other neighboring S.W.A.T. teams in Joint training exercises as well as live missions when requested. Once a year the team participates in the county’s Leadership program by performing a pre-rehearsed realistic mission using training munitions that look, sound, and feels real to the leadership members. Below you will find a list of a few Skills and Certifications the members on this team possesses. The Newton County Sheriff Office is currently working on its first Armored Vehicle which was donated by Brinks Inc. This addition to the team’s inventory will allow the team to move closer to threats while remaining safe for negotiations and or to execute a mission. So if you should see this vehicle passing by once its put in service, please wave and give a short prayer for their safety and the safety of those who threaten the peace and order in this County.